Buying pearls should be a memorable and enjoyable experience! At HinsonGayle, we’ve designed this guide to help our customers make an educated purchase that their loved ones can enjoy for years to come. If you have any further questions, we’d love to help! Feel free to contact us. 99% of pearls on the retail market are identified as “cultured pearls”. This means the pearls are farm raised. Not found in the wild. Think of who you are buying for. Think of her style Is she a young girl (think smaller pearls)? More traditional or into current styles? Does she wear lots of jewelry, large jewelry, or small delicate jewelry? Determine what you're looking for! Are you wanting a simple, versatile piece to go with any outfit? Looking for a statement necklace for a big night out? Pearls come in all shapes, sizes, and price points! By determining person’s individual style, and the look or occasion you wish to purchase for, you’ll be able to find the perfect piece of fine jewelry! Pearls come in all sizes and price ranges. We pride ourselves in providing the highest quality, yet affordable pearls to our customers. Our fine pearl jewelry comes in three quality collections (Link to the page) and to help you find something in your budget, you can search by price. Understand the different types of pearls. Pearls are not a “one size fits all” type of jewel. They are unique, custom, and something you should treasure for years to come! There are 4 major types of pearls that come in a variety of colors, shapes, sizes, and prices. 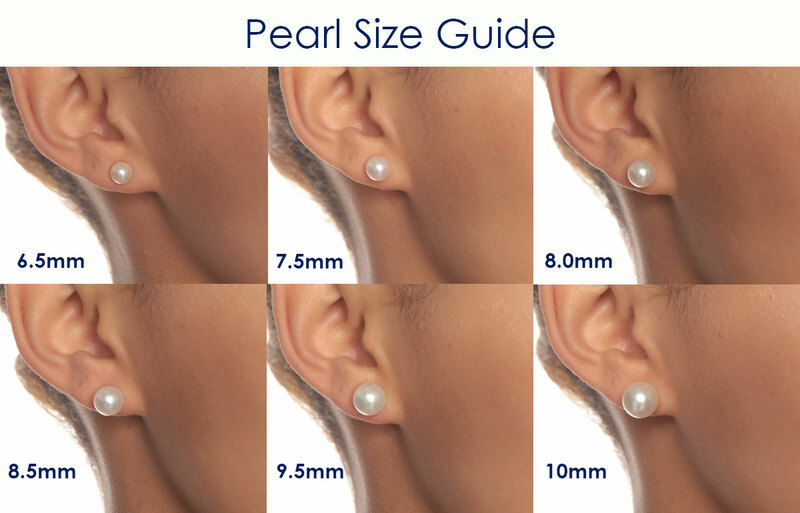 See the HinsonGayle Pearl Size Comparison Guide below to compare the different sizes of our pearl stud earrings and how they sit on your ear.